Sid Smart was a back row forward with a real turn of speed. His specialist position was No. 8. He rose from humble origins to play for his country, and to become one of the best loved members of the Gloucester Club. Sidney E J Smart was born on 14th January 1888 at Kingsholm, Gloucester, the son of a general labourer. In 1891 the family were living at 1, Lewis Buildings, Sydney Place, Wotton St Mary Within, Wotton St Mary, Gloucester, but by 1901 had moved to 87, Alfred Street. Sid was educated at the Deacon’s School, Gloucester, and started his playing career soon after the turn of the century with the Gordon League. By 1911, Sid had moved with his parents to 255, Barton Street, and he was then employed as a driller/railway at the Gloucester Wagon Works. He played his first game for Gloucester on 23 March 1911 at Kingsholm against Bream, and played in one more game before the end of that season. During the following season, 1911-12, he scored his first try for the Club against Cinderford on 2nd October 1911, and also scored tries in both matches against Bristol that season – in the 16-8 win at home and the 8-3 win away. He not only became firmly established in the Gloucester side, playing in 32 of their 40 fixtures, but also attracted attention from the county selectors. Within a few months of starting to play first class rugby, he was selected for the first county game of the 1911-12 season, playing for Gloucestershire against Monmouth on 12th October, and immediately became a fixture in the side. In January 1912 he went with the County to Ireland to play against County Dublin. Sid started the 1912-13 with a try against Bream in the first match (although this would prove to be the only one he scored all season). He was available for only 21 of Gloucester’s 40 fixtures, because he was in such demand for representative rugby. He played six matches for Gloucestershire. 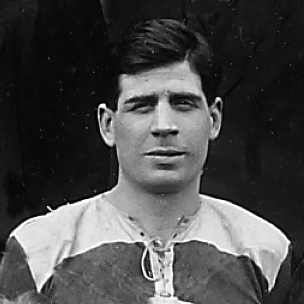 In the semi-final at Kingsholm, he was singled out – “Smart was a rare worker in all phases, and stood out as one of the best forwards on the field” – in helping his team to a hard fought 6-0 win. Sid and his teammates then went on to win the CountyChampionship for the second time with a 14-3 victory in the final against Cumberland at Carlisle. The impact he was making in the game had also been noted by the England selectors, and he was selected for the England side in both trial games, and in all of England’s internationals that season. He made his international debut in a 3-9 loss to South Africa at Twickenham, thus earning his first England cap less than 2 years after his first game for Gloucester. Sid retained his place in the side, and England went on to Grand Slam success, defeating Wales 12-0 (England’s first win in Cardiff since 1895), France 20-0, Ireland 15-4, and Scotland 3-0. In 1913-14, county and international rugby once more limited Sid’s appearances for Gloucester, and he played in 19 of the 37 fixtures. Sid again played a full set of 5-Nations internationals against Wales, Scotland, Ireland and France. The Great War then intervened, and denied Sid the opportunity of many further international caps (not to mention Gloucester and County appearances). Along with rest of the Gloucester team, Sid enlisted in September 1914 as a Private in A Company, 1/5th Battalion, Gloucestershire Regiment and landed in France on 29th March 1915. He was promoted to Lance-Corporal in 1915, and subsequently to Sergeant. He qualified as a Brigade Grenadier (i.e. bomber). He was wounded on 15th April 1916. When he had recovered, Sid was transferred as a Private to the Royal Munster Fusiliers, but was wounded for a second time, and discharged from the Army. Sid married Selina Sandford at Lydney on 4th August 1919. They had one son, Sydney, born in 1920. He would also become a back row forwardand play 133 games for Gloucester between 1945 and 1950. When rugby resumed at Kingsholm in the 1919-20 season, Sid took up his place in the team again, and scored his annual try against Swansea. Once more his appearances were limited by representative honours for the County and England. Sid again helped Gloucestershire to County Championship glory, beating Yorkshire in the final. He also played his last three internationals this season, against Ireland, Scotland and Wales, but still managed to fit in 16 games with Gloucester. In 1920-21, he played for the South v England in the second trial, but the South went down 8-31, he was dropped for the final trial, and his international career was over with a haul of nine caps. This rendered him more available for Gloucester, and he turned out in 30 of the Club’s 37 matches, including a try in a famous 10-8 victory over Harlequins at Twickenham. The Club also inflicted defeats on all four of the big Welsh clubs, a very rare feat for an English club – only Gloucester in 1898-99 and Devon Albion had managed it previously. Sid was still a fixture in the County side, contributing to their splendid record of Played 5, Won 5, Points For 96, Against 16, as they progressed to the County Championship. The final was played at Kingsholm, and was a day to remember as Gloucestershire romped home 31-4 against Leicestershire. Sid was elected captain of Gloucester for the 1921-22 season, and led the side to 24 wins and 3 draws out of 41 games played. Sid himself played in 35 of them, his absences the result of further selection for the County. Sid played in the 8-8 draw against Surrey at Richmond, in the 30-0 win in the replay at Kingsholm, and in the final at Villa Park, Birmingham, where Gloucestershire selected nine Gloucester players and defeated North Midlands 19-0. This completed Sid’s career with the County – 26 appearances and four county championship winners’ medals, three of them in consecutive seasons – his last three seasons with the County. Sid made way for Frank Ayliffe as captain of Gloucester in 1922-23 – he played in 34 of the Club’s 43 matches, but this was effectively his last season. He played only two matches in 1923-24, the first match of the season against Lydney on 8th September, and against Clifton on 27th September 1923. He didn’t play at all the following season, but strangely turned out for a final appearance for the club on 20th March 1926 against Bath at Kingsholm, more than 2 years after his penultimate game. Sid’s playing career for Gloucester thus spanned 10 seasons either side of WW1, during which he made 192 appearances and scored 12 tries. Sid was much loved as a personality at Kingsholm, both during his playing career and after. The crowd took to his commitment – indeed he was noted for his tremendous enthusiasm for any sport. He held the view that if one adopted competitive sport as a recreation it was up to the individual, and worthwhile too, to train hard, and prepare himself fully to give of his best. Much of his success as a player was due to his remarkable fitness, thanks to intensive training, with long walks a feature, which enabled him to go all out to the final whistle in the most strenuous contests. He took the same keen interest in training for track racing in the summer, and on one occasion he walked from Gloucester to Pershore to take part in a sports meeting, won the race, and “footed” it all the way back home. At the time of Selina Smart’s death in 1958, the couple were living at 51 Upton Street, Gloucester, and Sid was described as a retired roadman. By the time of Sid’s death, some ten years later, he had moved to 221, Barton Street. He was made a life member of the Gloucester club, retained his association with the Club throughout his life and was a popular figure around Kingsholm. Even when he was in his eighties, he continued to serve the Club he loved, as a steward in the grandstand at Kingsholm. And that is where he died on 25th January 1969, aged 81 – just before half-time in the Gloucester v Cambridge University match, he collapsed, fell down the steps, and was declared dead on arrival at the hospital. His funeral was held at St James’ Church and he was interred at ConeyHill Cemetery.